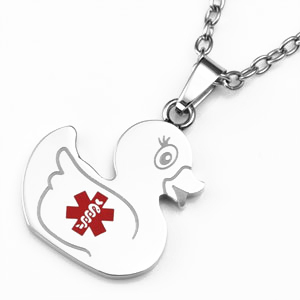 Stainless steel medical ID rubber ducky pendant loved by kids and kids at heart! Measures approximately 7/8 by 1 inch. 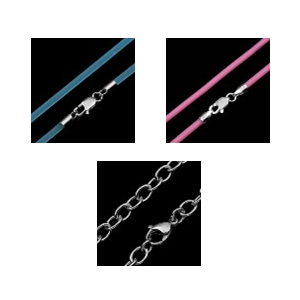 Choose a stainless steel chain or a colorful rubber necklace. 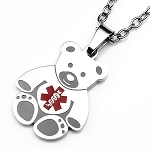 Other colors and necklace sizes may be available by request. 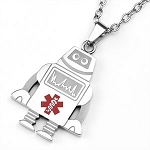 I have bought 3 maybe 4 things from Elegant Medical Alert. I have loved all of them. 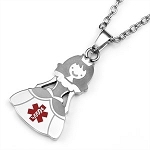 The only thing about the charm is that the connector has come loose, and it fell off. After a quick fix, it "works like a charm."